It goes quite well, as you might expect. 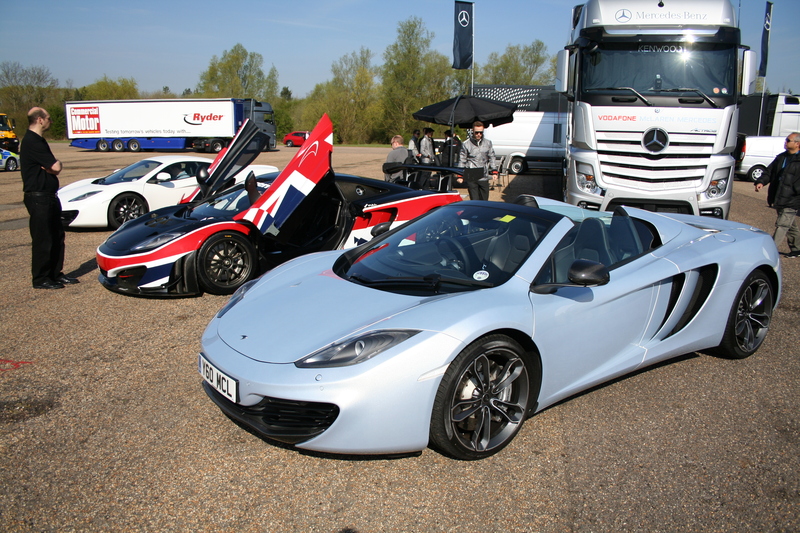 A selection of MP4-12Cs, closest we have the open top, in the middle is the racing GT, and at the back is the coupe. continually change gear as I drive round the high speed test route, each shift commanded by a simple flick of the very well placed steering wheel paddles, left for down shift, right for up. It’s simple, intuitive and works fantastically well. Not that it really needs to, the torque curve from the engine is indecently flat, pulling as strongly at low revs as it does near the ear splitting red line. 600Nm from 3000rpm to 7000rpm from the 3.8 litre V8, which is more than respectable in a sub 1400kg car. Uncluttered dash, all controls to hand nicely. supercar, but it doesn’t knock your teeth out with a bone crunchingly harsh ride, ok it’s a bit firm in ‘Normal’ mode but perfectly acceptable and makes long journeys a completely reasonable proposition. 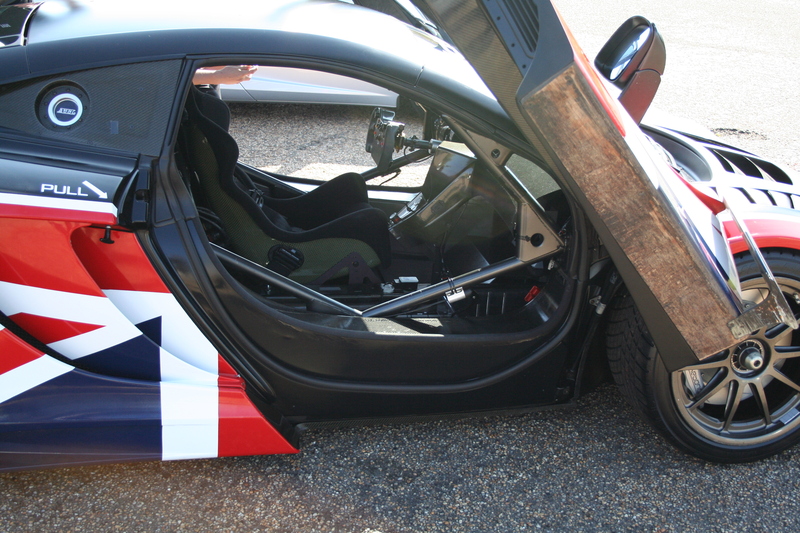 Even getting in and out is made easy by the wide aperture and decent leg room, unlike many other supercars. In fact the whole cabin is an ergonomic triumph, everything you need is where you need it. The seats are comfy but supportive and can be adjusted for a diverse range of body shapes because they contain a number of inflatable bags which you can set to suit yourself. The controls are very well placed and everything the driver could need falls nicely to hand. The rear view over the transparent engine cover is a little narrow but perfectly usable. Transparent cover displays the 3.8 twin turbo V8. And that cover lets you see the throbbing heart of this magnificent creation: a twin turbo V8 that at low speeds makes an exhaust not reminiscent of might Deltic locomotives, the throbbing engine complemented by the whistle of turbines, but once up to speed make a screaming soundtrack that lets you know that the manufacturer learnt its craft on race tracks. You might think a transparent engine cover is a little exhibitionist, but why not show such beautiful craftsmanship? After all, this car is street theatre, just like any other supercar it’s more art than transport, you buy it because you want it not because you need it. But this piece of art is more subtle than many of its competitors, the lines are uncluttered and have a beautiful simplicity that doesn’t need to be decked with multi stage wings and complex splitters to work. Simple elegant lines, a pretty car. 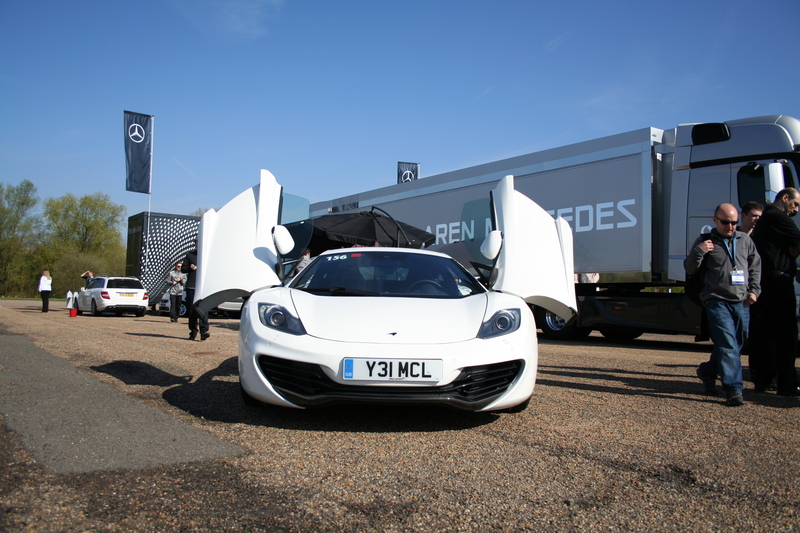 This is a testament to the skill and experience of McLaren aerodynamics engineers, they are arguably the best in the business and have made a shape that inherently works. The rear wing is an inherent part of the rear design, not just bolted on. Not only that but they have added a few features so that the downforce and drag can change to suit your driving mood. 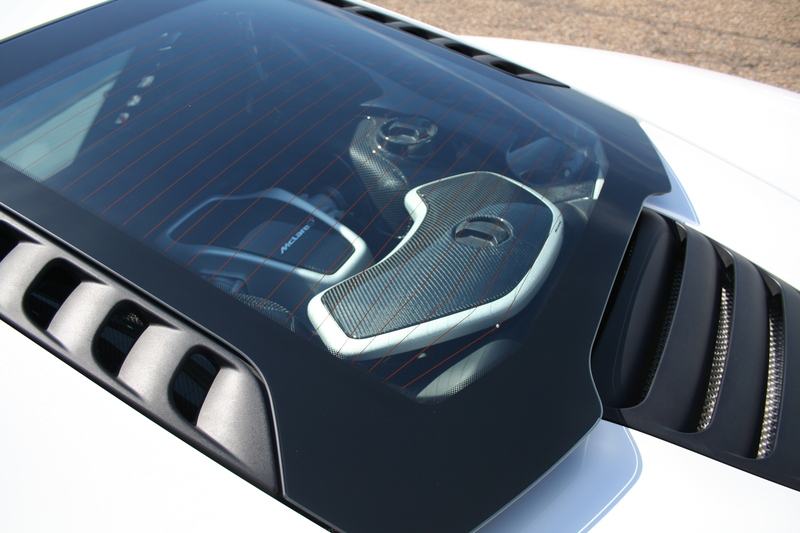 There is a button that provoke active aero, a rear spoiler popping up under heavy braking to give greater traction and also work as an air brake, something they first tried on their mighty Mercedes SLR. Yes it has a rear wing, but its a beautifully integrated part of the design. Mood control extends further, there are two rotary switches to set up the car for your chosen task, each has three settings: Normal, Sport and Track. On the right we have Powertrain control which adjusts the way power is delivered, more instant and aggressive for track, more gentle and progressive for road. It also sets the gearbox up for fast hard shifts on track and soft comfy shifts on road. On the left we have the Handling control which adjusts damper firmness and the effect of the active roll control. This is all the adjustment you could need, if you want a fast blast on rough country roads then leave the suspension on Normal and switch the powertrain to Track, there are sufficient options to tailor the car to your preferences. I like that, it’s flexible, effective and simple. 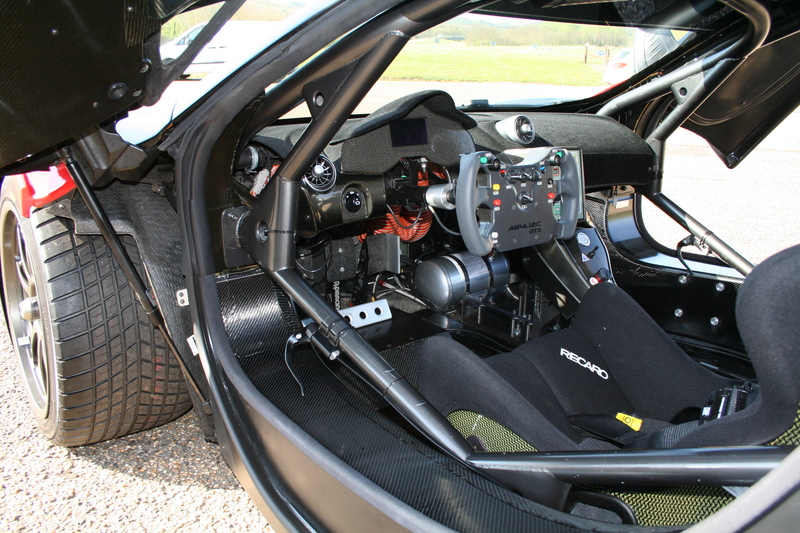 Race car interior is also nicely laid out, note the gratifyingly wide front tyre. Driving the car is a joy, the soundtrack from the engine is delightful and only intrusive when you’re going a bit too fast for the road anyway, drive within reason and you could sit here comfortably all day. But get on a smooth track and twist the controls to 11 and this car will throw you at the horizon with indecent haste. Road car is only one step away from this GT racer. But if that is not enough for you, there are special track and race versions too, the CanAm harking back to Bruce McLaren’s racing heyday, and the GT picking up where the old F1 LeMans cars left off. So underneath this fine road car is clearly the heart of a race car. It really can deliver, it’s not just some pretty boy wanna be, it’s well though out proper engineering. Hugely competent without shouting about it, very British in a way. In summary, I like it, quite a lot. 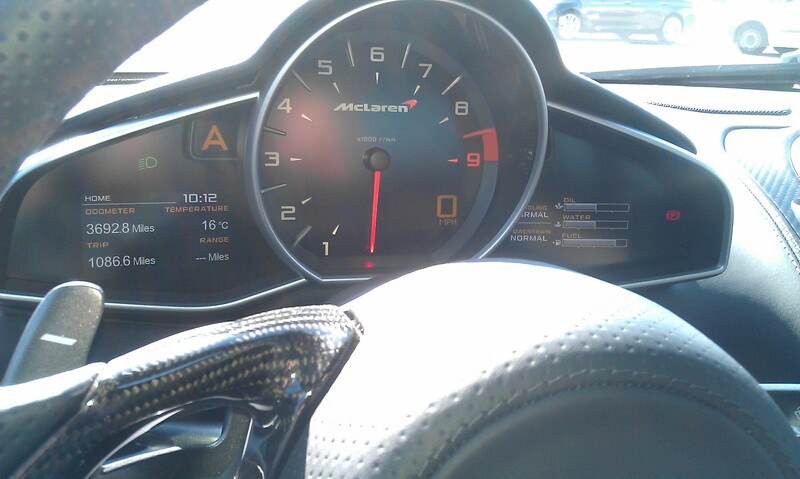 McLaren really do make damn good cars.